Shoppers start their buying journey online. At ARI, we help them find you! 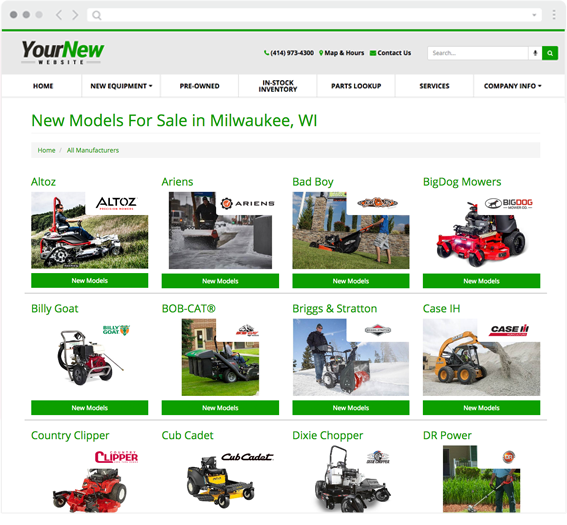 Your ARI Dealer Website converts browsers into buyers. Lead generation Request a Quote, Request Brochure, Insurance Quote and other calls to action drive more qualified leads, phone calls and in-store visits. Search Engine Optimization Responsive design, lightning fast load times, Google XML sitemap verification and optimized meta data send strong SEO signals for increased site traffic. 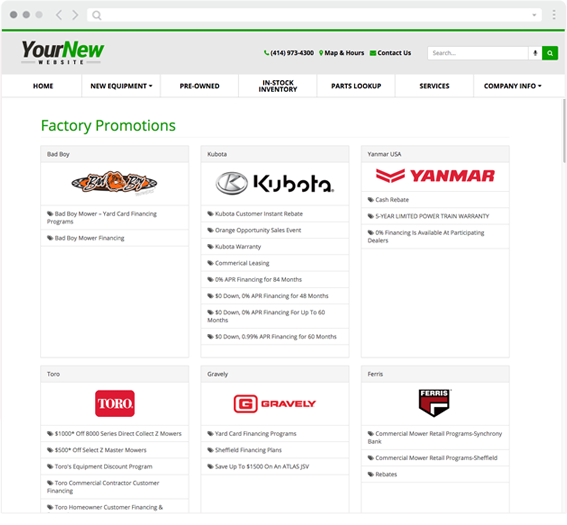 OEM And Aftermarket Content Full access to ARI’s industry-leading OEM parts and PG&A content plus whole good inventory data and up-to-date manufacturers promos and rebates. Ecommerce Our integrated shopping cart streamlines the online buying process, helping you sell more. Service Scheduler Our Service Manager tool makes it easy for visitors to schedule service appointments 24/7. 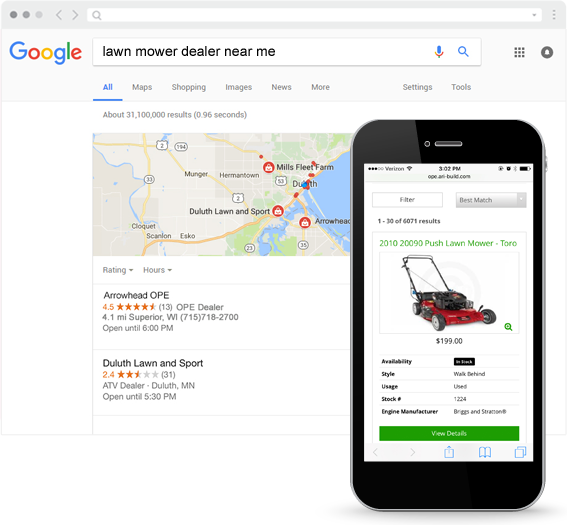 Request a Quote, Request Brochure, Insurance Quote and other calls to action drive more qualified leads, phone calls and in-store visits. Responsive design, lightning fast load times, Google XML sitemap verification and optimized meta data send strong SEO signals for increased site traffic. Full access to ARI’s industry-leading OEM parts and PG&A content plus whole good inventory data and up-to-date manufacturers promos and rebates. 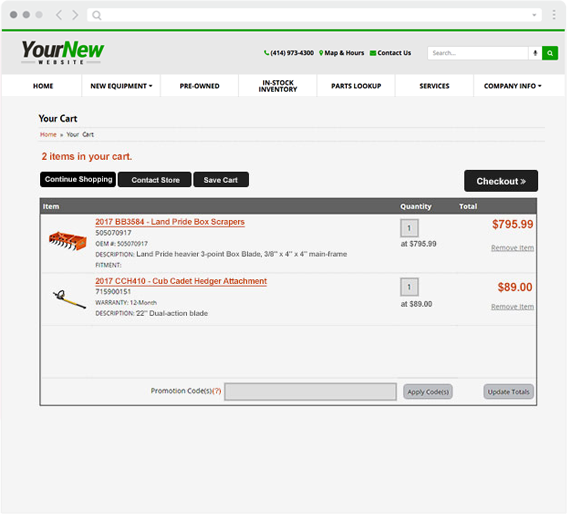 Our integrated shopping cart streamlines the online buying process, helping you sell more. 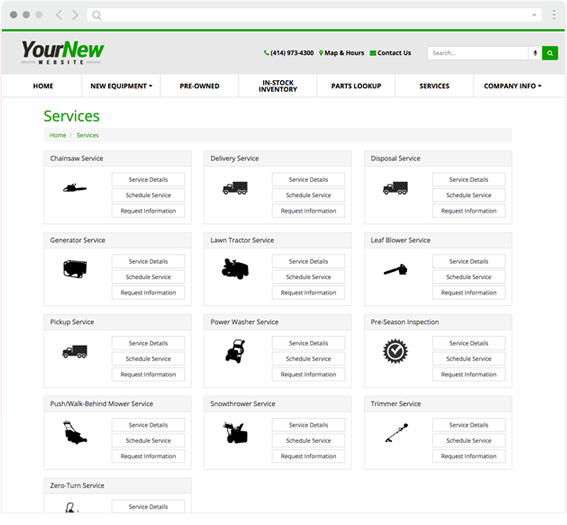 Our Service Manager tool makes it easy for visitors to schedule service appointments 24/7. More site traffic. More leads. More calls. More in-store shoppers. The tools and support you need. Intuitive Content Editor Easy-to-use content management is paired with innovative data and lead management tools. Mobile Inventory App Manage and update inventory, including photos and product details, from any mobile device at any time. DMS Integrations Integration with popular dealer management systems makes managing your inventory even easier. Consultations & Support Success sessions with your account manager to review site performance along with ongoing, on-demand support. Want a free website & digital marketing performance check-up? Learn how ARI websites make a big difference for dealers like you. We have been a customer of ARI’s for over 5 years. We have been very satisfied with the design and the performance of the site. Our customers tell us how user friendly the site is, and how easy it is to navigate and find what they’re looking for… I strongly recommend ARI.